Loch Laro is a beautiful sight to stumble across, and that is just what you do on the way into it, the view alone is well worth the trip. 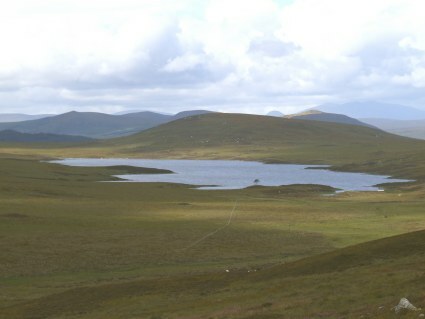 It is a chance to look down on a Hill Loch, a pleasant change from climbing into one. The price you pay is a longish trek if your vehicle will not take you right there. There are spots along the way where it is possible to leave your vehicle if you do not want to risk it any further. Again it is a case of a four wheel drive, a vehicle with good ground clearance or a stout heart. To reach the loch go past the Loch an Lagain turn-off for about 750 yards until you come to a metal gate on your left, it is quite well defined. Again please remember the Country Code with regard to gates, leave them as you find them. Follow a rough track for about 1 mile until you come to a fork in the track, go left here for Laro. This track is in reality the same track that runs beside Loch an Lagain, it is the remnants of a track that Andrew Carnegie had constructed to take him from Skibo Castle to Aultnagar, his hunting Lodge, he travelled by horse and carriage. Stay on this track and it will take you to the end of the Loch. Here the association’s boat is moored. If you are still in your car, there is a small turning area at the end of the track, it is quite apparent once there. Once again with regard to flies it is the usual hill patterns with something black and small usually doing well, but be sure to ring the changes with fly type, as each day can vary so easily. As ever the Loch contains hard fighting wild Brown Trout and could easily provide you with a grand supper or breakfast. There is no mobile phone signal.